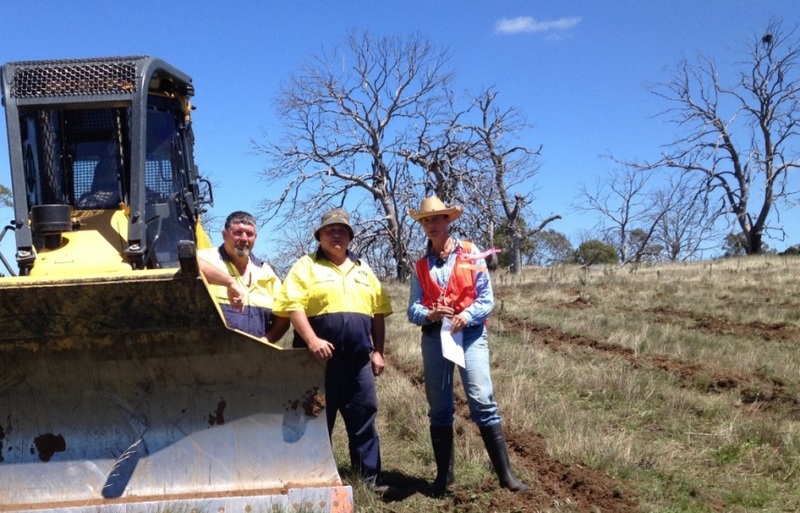 The Upper Snowy Landcare Committee (USLC) have embarked on a large scale revegetation project amongst the dieback scarred hills between Cooma and Berridale and with funding from Local Land Services have put on an employee to manage the action. Dieback project work has now commenced with contractors ripping 8ha of tree lines over four properties situated in the visual corridor of the Kosciuszko Highway. Everyone who has driven this stretch of Highway will be familiar with the mass loss of mainly Eucalyptus viminalis (Ribbon or Manna Gum) trees along the ridges. These monster trees, that once provided refuge to a host of native and domestic animals, now effectively haunt the vast open landscape. The primary cause of death is unknown with endless opinions ranging from; the past drought causing the trees to weaken and thus more prone to Eucalyptus weevil (native) attack which then ultimately kills them; lack of seasonal cool ground cover burning; soil fungus or the trees just naturally dying off at the edge of their range. Despite the cause, the tree loss has fractured habitat connectivity making life difficult for animal species such small bush birds, reptiles, terrestrial and arboreal mammals from moving under the safety of the tree canopy to feed and breed. Also the tree loss has opened up country to new erosion events and weed incursion, not to mention the tremendous loss of shelter belt benefits and the danger of trees falling on people and fences. To get the ball rolling the USLC have employed Lauren Van Dyke as the Dieback Project Manager, having engaged her previously on a short contract. Ms Robin Sevenoaks, USLC Chair said, “the USLC committee is so energised to work on this unique and dire situation it has committed significant money to establish four trial revegetation plots”. “Each of the visual plots will be sown down to more than 1000 mixed species of local trees and wattles. Not only that, every step of the preparation and planting process will be written up in a free ‘how to guide’ as we follow the Monaro Tree Nursery planting methodology”. “This nursery has had great success establishing tree plots and are currently growing seedlings for our Autumn planting. Ultimately, the formula for successful revegetation in our harsh climate will then be available free to all landholders to emulate. If landholders can see our plots, receive our planting guide then go and plant their own plots this will be our best chance to replace this valuable vegetation on mass”, said Ms Robin Sevenoaks. The latest big coup for this important work is the news that Greening Australia and CSIRO will now join the dieback effort after receiving a successful 10 year Bush Connect Grant from the NSW Environmental Trust. This new funding will be spent in the dieback area to establish further trial sites over future years to investigate the benefits of planting more robust and persistent species, test cool burning to enhance soil quality and target planting of connectivity links between existing remnants.